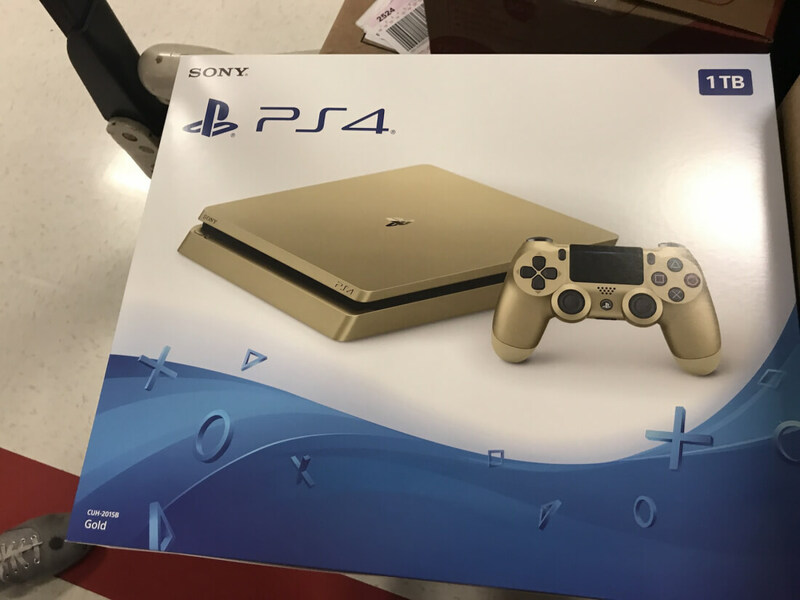 A Target employee may have leaked that Sony is preparing to release a gold-colored PlayStation 4 Slim. Someone claiming to work for the retailer apparently snapped a photo of a boxed Gold PS4 Slim and said that they are going on sale next week for $249. The alleged employee posted the picture to Reddit under the handle Marmaro8, but the image has since been removed from Imgur. While the removal does not confirm that Sony is indeed releasing a gold PS4, it does indicate that the poster may have been told to remove it by someone of authority. According to Geeksation, there have already been as many as four separate reports of gold PlayStations being spotted in stores. Another Redditor, Christopher_Maxim, claimed to have almost bought one of the goldenrod units at Walmart that was accidentally put on shelves early. "This Walmart put them out early. Register locked up when I tried to buy one, and the staff realized their mistake. I snagged a pic before they brought them out back." The $249 tag is distinctly seen in his picture, which corroborates Marmaro8’s claim of the sales price. Back in 2015, Sony ran a promotion with Taco Bell where it gave away a gold limited edition PlayStation 4 every 10 minutes to any one who bought a Taco Bell Big Box. The company ended up giving away 6,000 of the shiny gold consoles, which also included a matching gold controller, a copy of Uncharted: The Nathan Drake Collection and a one-year subscription to PlayStation Plus. While Sony has not announced a gold edition PlayStation 4, by all accounts, there is substantial evidence to suggest that one is coming. Furthermore, if the claims are valid, the golden consoles with go on sale next week on June 9. However, it is unknown whether the system will be available worldwide as the units have only been spotted in the U.S. so far.